Many will be the national memories of Gough Whitlam. Here are some recorded in historic photos illustrating how he gave Aborigines the rights to their own land. You probably won’t see a photo like this again, an Australian Prime Minister swigging champagne. …or like this, with an Aboriginal leader (Vincent Lingiari) sharing the same bottle with a PM (Gough Whitlam). 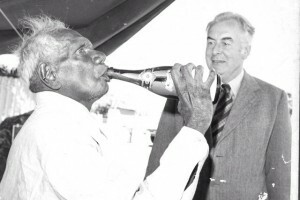 Prime Ministers since Hawke have shied from champagne swigging. It’s not politically correct for a PM to be seen handing a bottle over for an Aborigine to take a swig. And the PM’s minders would quickly veto any photo being taken. That’s why these remarkable shots by Civil Liberties Australia member Robert Wesley-Smith are so historic. What’s more, Rob was the one who provided the champagne! The occasion was the handback in 1975 to the Gurindji people, represented by their leader, Vincent Lingiari, of the Wave Hill station area of their traditional lands. They had won the right to own freehold title to their traditional lands after a strike of eight years. 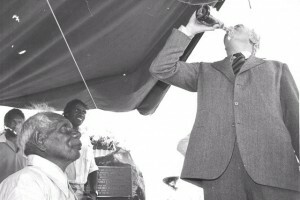 From the Gurindji action, and the Whitlam governments willingness to treat Aboriginal people as equals, major events in Aboriginal land rights flowed. That’s why the moments seen above are celebrated in a now-famous song, From Little Things Big Things Grow. Gough Whitlam has died this October 2014. Australia mourns a giant of a man and a PM who, in three shorts years, changed the nation forever for the better. 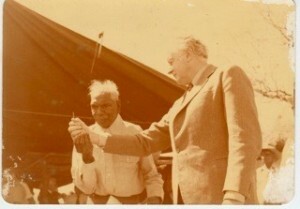 Vincent Lingiari died in 1988, aged 80. Below is the REAL photo of the famous “pouring sand into the hand” photo of the event. The much celebrated photo, a copy of which hangs in Parliament House Canberra, was actually re-staged for the travelling cameras. This photo, by Rob Wesley-Smith, is the one that captured the moment the first time it was done, for real. – with thanks to Rob Wesley-Smith for permission to reproduce his photographs. These historic photographs seem from another era in time, an era so divorced from what Australians are experiencing now as to be as relevant to most as Greek, Egyptian and Persian history. “Progress” has taken on a Darwinian mantle, but it is not the fittest and most intelligent which survive but the richest. While living in the past, dwelling largely on false memories, may be comforting, the “future” is becoming an ever more threatening, daunting and merciless prospect.